If you're serious about building real upper-body strength, you owe it to yourself to work up to 20 strict, full-range-of-motion pull-ups. Here's the plan to get you there. 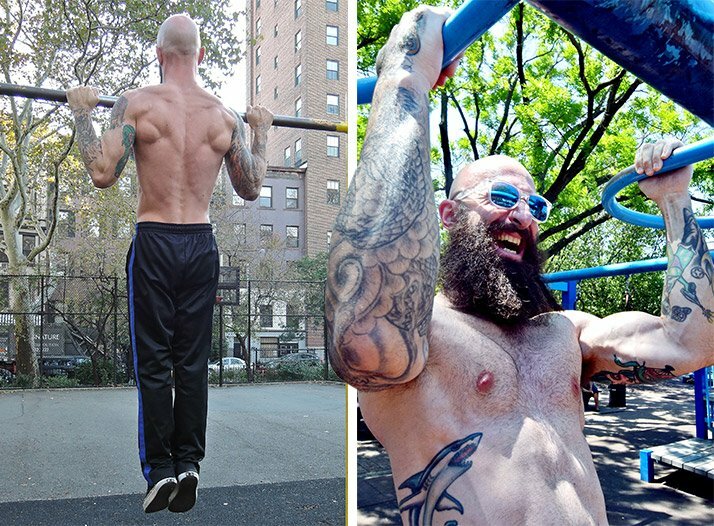 Sometimes the big guys get annoyed when they see a 160-pound tattooed beardo like myself doling out muscle-building advice. After all, what could I possibly know about gaining strength and muscle? I'm just a skinny guy! The truth is, you don't need to be huge to be strong. Sure, you can be both, but you don't have to be one to be the other. As far as I'm concerned, mastery of one's own vessel is the purest form of strength. Remember, the lion is king of the jungle in spite of the fact that an elephant is ten times his size. If you want to be a lion in the gym, you should start by mastering the pull-up. It's the ultimate equalizer, putting the big boys on a level playing field with smaller-framed fellows in a test of my favorite kind of strength: relative strength. I don't care how much you can deadlift; if you can't do 20 strict pull-ups, you're not truly strong—yet. But I can help you get there. A few of you have probably already started typing up comments about how pull-ups are an unfair test for big guys. Sorry, but I don't buy it. A 250-pound person shouldn't have any more trouble doing 20 strict pull-ups than a person who weighs half as much, unless that 250-pounder happens to be carrying a lot of excess body fat. I don't care how much you can deadlift; if you can't do 20 strict pull-ups, you're not truly strong—yet. That's one of the great things about pull-ups: They keep you honest. If you're gaining weight and your reps on pull-ups are going down, you're getting fatter. If your reps stay the same or go up, you're getting stronger. It's that simple. So stop kidding yourself that your 20-inch guns are pure muscle. Anyone who's 250 pounds of solid muscle should have no problem with this challenge. On the other hand, if you're someone who need a fat-loss goal that feels more satisfying than a number on the scale or body fat percentage, you could do a lot worse than this test! Before you worry about getting to 20 reps, let's make sure you can do one proper pull-up. Compared to other calisthenic staples like a handstand or pistol squat, both of which require a significant degree of neurological training, pull-ups are very simple to perform. This is another reason why they are such a great standard for strength. Just grab the bar tightly, keep your legs straight, and brace your entire body as you pull your chin over the bar. 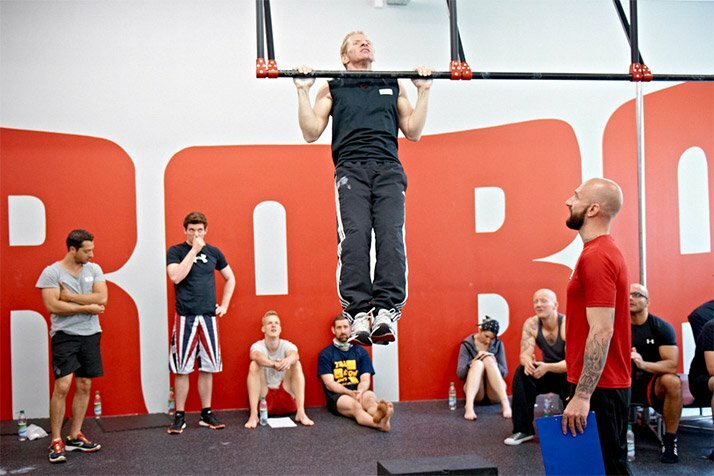 Pull-ups are very simple to perform, which is why they are such a great standard for strength. It's important to get in the habit of doing clean reps from the get-go. None of the 20 pull-ups that will demonstrate your pound-for-pound prowess can involve the use of momentum. Though you obviously have to lean back a bit to avoid hitting your head on the bar at the top of a pull-up, your torso shouldn't travel very far forward or backward. Keep your body tight! For this challenge, you can use the grip of your choice: overhand, underhand, or a neutral grip with palms facing each other, which some people may find more favorable to their joints. As long as you come to a full extension at the bottom of every rep and make sure your chin goes above the bar without any uncertainty at the top of all 20 reps, you're good to go. Once you've established solid pull-up technique, it's time to start adding up those reps. I recommend setting a target number of pull-ups in each of your training sessions, then make it your goal to hit that number, no matter how many sets it takes or how much rest you need between sets. It's important to avoid sacrificing your form in an attempt to complete more reps, though. If this test is your goal, quality will get you there faster—and feeling better—than sheer quantity. This is why I encourage long breaks between sets. Don't sacrific form in an attempt to complete more reps. Quality will get you to your goal faster than quantity. Once you're able to complete the target number of reps, gradually begin working to reduce the amount of time and number of sets it takes to complete the reps over the course of the next several workouts. When you can do your goal reps in less than 15 minutes total, including breaks, you can increase the total number of reps and begin the process again. In order to determine the reps you should be aiming for in each workout, test yourself to find out your current max number of pull-ups in a single set without coming off the bar. Then, use the chart below to determine the best way to progress. Do this workout only once or twice a week at first, making sure you give yourself enough recovery time between training sessions. You should be pretty much 100 percent recovered from the last session before you do it again. Even if you are doing this twice a week, you'll still want to hit the rest of your muscles with other exercises, but you probably won't need to do much else for your back and biceps. Though progress will come slower or faster for different people depending on a number of factors, anyone who stays consistent over time will eventually start to see improvement. After a couple of weeks, you can add in a third or even a fourth day, as long as you feel you are recovering quickly enough. If you train pull-ups hard, you won't need to do much else for your back and biceps. Then, when you feel ready, take a few days off and test yourself. Keep your form strict, only grind as much as is absolutely necessary, and if it helps, have someone else do the counting. When you feel your form slipping, stop—even if it's at 19 reps. Sure, you'll be disappointed, but comfort yourself with the knowledge that you're still doing wonders for your upper-body strength by adding these quality reps to your training. Keep it up, then come back and try again! Twenty pull-ups may not seem like very much in theory, but it's surprisingly rare to see them performed cleanly and with a full range of motion. I hope you'll take this challenge seriously and not underestimate its difficulty. It's time to raise the bar on your pull-up game!